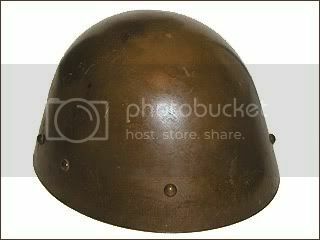 Known as the "last" pattern as the Czechs had gone through many models of steel helmet before finally deciding upon this one. 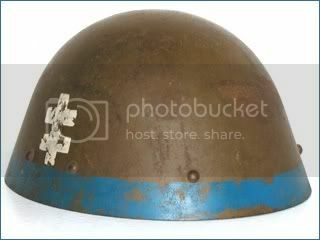 (ie; the models of 1919, 1921, 1922, 1923, 1926 and 1930) This pattern helmet was produced in fairly large numbers from the early thirties until the German take-over in 1938. The Slovak army fought along side the Germans during the Soviet campaign. 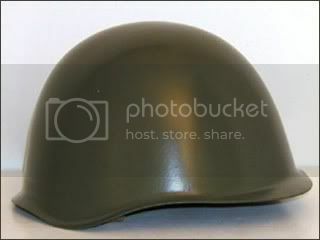 The Slovak army used the basic uniform of that of the pre-war Czechoslovakian army including the M-32 helmet. 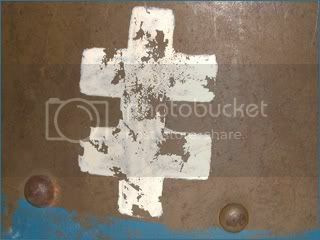 During this campaign the Slovaks painted the rim blue and added the Slovak cross to both sides. This was reportedly done to avoid confusion with the Soviet helmet. This is a Soviet SSh-40 style shell, produced in Czechoslovakia with an M31 German World War II type liner. This helmet was primarily used in Czechoslovakia, but also in various Soviet Bloc countries throughout the Cold War.